If you don’t already know by now, I absolutely love books on hunting and fishing. It’s hard to beat a good book by Burton Spiller, Havilah Babcock, Corey Ford, E. Donnall Thomas, Jr., Robert Traver, William G. Tapply, Grandpa Grouse and the likes. My brother Shawn and I collect as many books on bird hunting and fly fishing as we can get our hands on. As you can guess, some books are better than others. As part of this blog, I thought the contributors should start giving book reviews of sporting books–both old and new. By way of warning, however, I want to state at the forefront that I generally detest “Where-to/How-to” books as they are typically a recipe for extreme boredom. I think it is sad that this is where our outdoor literature is headed. No, for me, the greatness of a book turns on how well the author tells a story. So, at least for my book reviews, I will only focus on sporting books that fit this genre. Hopefully, this will help you in your quest to find good books, especially at this time of year. I recently acquired a book entitled, The Upland Game Hunter’s Bible: A Complete Guide to Game Bird Hunting by One of America’s Foremost Sportsmen by Dan Holland (1961) from the local used book store. At first glance, I questioned whether this paperback book would be any good. By the title and it’s original price, it appeared to be a mass-produced paperback, Where-to/How-to. As I thumbed through its pages, I quickly learned that looks can be very deceiving, especially when the word “Tinkhamtown” caught my attention, but more on that later. The chapters are generally based upon the various game birds on this continent from turkeys to valley quail. While this is by no means a novel approach to bird-hunting books, Holland uses his own personal hunting experiences to make each chapter unique and entertaining. Holland tells some great stories. For example, in the chapter on guinea fowl, Holland shares an interesting story on hunting this African gamebird in Cuba (before Castro took over) when he harvests a rare albino bird. In another chapter he tells of a funny hunt for tinamou (or perdiz as they are known in Spanish) in Chile with his exhausted mozo (youthful guide/bird fetcher), who follows the crazy author over hill and dale to find the elusive bird. 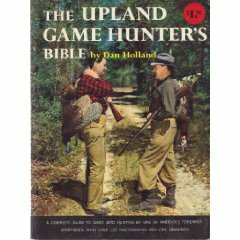 By way of background information, the author, Dan Holland, was the son of the late Ray P. Holland, who also wrote some excellent books on upland bird hunting (i.e. Shotgunning in the Uplands, Seven Grand Gun Dogs, etc.) in the early to mid-1900’s. What I did not know, but discovered by reading this book is that Dan Holland was also hunting partners and good friends with some of the other great outdoor writers of his time, Corey Ford and Ted Trueblood (a fellow Idahoan like me). In fact, Corey Ford, with his unmistakable grin is on the cover of the book holding a turkey. In the book, the author tells some excellent stories about hunting with these writers. The chapter on hunting bobwhites with Corey Ford in the south is particularly good and funny, as one would expect since Corey Ford (who was one of the foremost humorist writers of his day) is involved. Holland writes of hunting huns in Oregon and valley quail in Idaho with Ted Trueblood in numbers of biblical proportions–the kind of thing all bird hunters dream about. Of course he’d never mentioned [Tinkhamtown] to Doc. There are some things you don’t mention even to an old hunting companion like Doc. Things like a secret grouse cover you didn’t mention to anyone, not even to as close of friend as Doc was. No he and Cider [his setter] are the only ones who knew. They had found it together, that long ago afternoon, and it was their secret. “This is our secret cover,” he had told Cider that afternoon, as he lay sprawled under the tree with the grouse beside him and the dog’s muzzle flattened on his thigh. “Just you and me.” He had never told anybody else about Tinkhamtown, and he had never gone back after Cider died. Although fictional, the “The Road to Tinkhamtown” contains many elements of fact. We learn from Laurie Morrow, Corey Ford’s official biographer, that Corey Ford really had a dog named “Cider,” he truly had a special secret covert named, “Tinkhamtown,” and after Cider died Corey did not go back. See, Cold Noses and Warm Hearts: Belowed Dog Stories by Great Authors, by Laurie Morrow. I don’t think there is much argument that the subject of the story is really Ford himself, as opposed to the fictional Frank. “Where’d you get the fine pa’tridges?” a farmer asked me as I dragged my feet wearily down the little New Hampshire road to my parked car. I told him that Tinkhamtown was across the mountain within walking distance of where we stood. I knew because I had been there, taken my limit of grouse and had come back all in the same day. The mystery was explained by an old map I had chanced on which clearly showed a town and farming community which no longer existed. Being a partridge hunter, I had hiked there, found the old cellar holes, the vanishing traces of pasture land, the overgrown orchards and ruffed grouse almost in flocks. I explained this to my friend. He cogitated for a moment and allowed as how it might be a fact: long ago there were farms over the mountain, but no more. The last resident had moved out at least sixty years ago. As you can see, Corey Ford was not the only one who knew about Tinkhamtown. In fact, according to Holland, he is the one who discovered the map that led to this special covert. I’m sure that–in reality (as opposed to the story)–Holland passed this information on to Corey Ford, who later wrote one of the greatest hunting stories ever about this special place. Notably, in the last part of Ford’s “The Road to Tinkhamtown” (as he originally wrote it) as the hunter dies and passes on to Tinkhamtown: “He paused at the stream just for a moment. He heard men’s voices. They were his hunting partners, Jim, Mac, Dan, and Woodie.” Now I know that the “Dan” of whom he speaks is none other than Dan Holland, the author of The Upland Game Hunter’s Bible. Of course, Ford couldn’t leave out the very friend who showed him this extraordinary covert in the first place. Man, for a sporting book nut, that’s good stuff! In Gun Dogs & Bird Guns, the late and great Charley Waterman wrote that The Upland Game Hunter’s Bible “deserves more attention than it gets.” I’ll go one step further. I think this great book is a hidden treasure in sporting literature. My only wish is that the book would have been published in hardback as opposed to the mass-produced paperback. On a positive note, however, you can now find the book cheap for not much more than the original $1.95 for which it originally sold. My copy is in excellent condition and I only paid $2.50. From this great book, I learned once again to never judge a book by its cover. I hope you all enjoy this work as much as I did. Next Post THE MAKING OF A "BIRD-DACHSHUND": DIGBY FLUSHES AND RETRIEVES A CHUKAR PARTRIDGE! THE LEGEND GROWS. Andy, I share your enthusiasm for the all things written by the Hollands, father and sons. They were great sportsmen and good storytellers. The Corey Ford reference is so touching–Ford was one of the giants in outdoor writing and also a great patriot. Many of his Lower Forty columns in Field & Stream dealt with servicemen going to, coming back, and sadly, sometimes not coming back from the wars of the decades in which he lived and wrote. This country is much poorer due to the passing of the Fords and Hollands and Babcocks and…. Well, you know them Andy. Thanks for starting this thread in fabric of the blog. I will join in shortly with a review.